Goddess Tripura Sundari is third manifestation among Dasamahavidyas, she is also known to be sri vidya or Shodasi. According to Vedic Scriptures she is considered as the 16 years old girl. It is accepted that those who offer prayers and puja to Maa Tripura sundari are blessed with all good prospects of life without any obstructions. 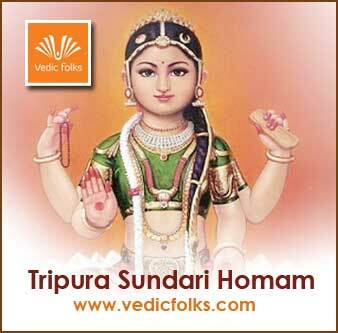 Goddess Tripura Sundari Homam plays a vital role for removing any karmic issues and doshas in an individual life to have a trouble free life. She blesses her devotee's with more knowledge and wisdom to attain victory all endeavours. Furthermore performing this homam provide us with all riches in life. Goddess Tripura Sundari Homam is very beneficial for one to get relief from any sorts of restrictions in business or profession. Well suited homam for those who facing problem of delay in marriage. In addition performing this homam prevent an individual from daridra dosha. Furthermore those who perform this homam are provided with the power of courage and strength to control and manage any difficult situation. To get all the bounties and experience the enormous integrity of Tripura Sundari Homam (fire customs or lab), you can get the assistance of our accomplished Vedic Purohits (intellectuals) at Vedicfolks.com on the web.